When shopping for replacement windows, it's important to consider your budget, your home's style and how you want the windows to perform. 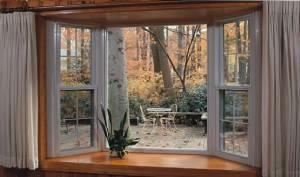 Some other things to think about when selecting windows are ventilation, privacy, security, and maintenance level. Bay windows give your home a great view of the outdoors. Adding a bay or bow window to your home creates the illusion of a larger space on the inside and that extra touch of style to the outside. Each bay or bow window is built using our high-quality vinyl windows in Double-Hung, Casement, or Picture window configurations, giving you a lifetime of worry-free operation. Constructed out of oak or birch and sealed to prevent rot and water infiltration, your new window will not only be beautiful but functional as well. We won’t sacrifice energy efficiency or quality construction while creating your unique, attractive, and innovative window. Each window is custom designed and built to ensure a perfect fit for a remodel, new construction or even a replacement. The exposed wood on the interior can be factory- or field-stained or painted, and paired with one of the interior wood laminates available for our vinyl windows. Create a stunning look both inside and outside your home that adds a unique and beautiful flare, without detracting from the functionality of your home. Bow windows create a beautiful aesthetic with an open feel for your home. Bay windows: These are traditionally built in three sections with a large picture window framed by two smaller pieces. This formation allows for large, unobstructed views that add character to your home’s exterior, while also adding natural light and airiness to its interior. 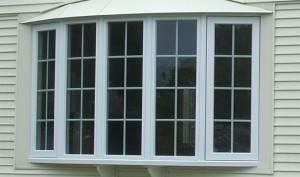 Bow windows: These are traditionally built with four to six panels that project out and give a more rounded appearance. These windows give a gentle curve on your exterior, offering shape and architectural design to your home’s exterior. Add an illusion of openness and create a focal point in any space. Casement windows are hinged on one end and pivot out for ventilation at the other end. They're easy to open and provide good air flow. Double-hung windows are one of the most common types of windows. Both the upper and lower sashes open for ventilation. Many double-hung windows are designed with a sash that tilts inward, making it easy to clean the exterior surface of the window from inside your house. Picture windows are fixed units that are designed to give you a wide, unobstructed view and let in lots of light. Still trying to decide on the best window style for your home? Custom Built can help. During your free in-home consultation our experts will help you choose the window style and features that best fit your home's needs. Contact us today to request your free estimate in Colonie, Troy, Albany or nearby.